Attend the largest massage therapy conference to experience unparalleled continuing education, network with your peers, and try out the newest products in the extensive exhibit hall. 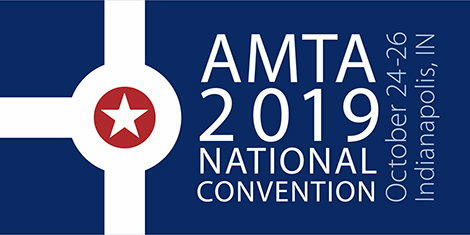 Registration is now open for the AMTA 2019 National Convention taking place October 24-26 in Indianapolis, IN. Practice new massage techniques in hands-on classes, and broaden your knowledge with courses in business, self-care, ethics, research or teaching. Earn a year's worth of the highest quality CE hours when you choose from 30+ classes. Come be inspired by a different speaker each day. Meet the speakers now, before hearing their inspiring stories at Convention. There's more to Indianapolis than fast cars! Named one of Condé Nast Traveler’s Best Big Cities of 2018, Indy is home to museums, memorials and an 8-mile bike and foot trail taking you through downtown and residential neighborhoods. Come explore all that Indy has to offer! Top five ways to take in Indy!